There is important information in the Fujifilm Finefix 2300 Manual. For example about learn to using basic camera setting, photography tutorial and troubleshooting. The Fujifilm Finefix 2300 comes with main specs and features such as 1.6-inch LCD Monitor, 1/2.7-inch square pixel CCD, SmartMedia (3.3V), 64 zones TTL metering, Auto flash using flash control sensor, and measuring 110✕ 77✕ 39mm. 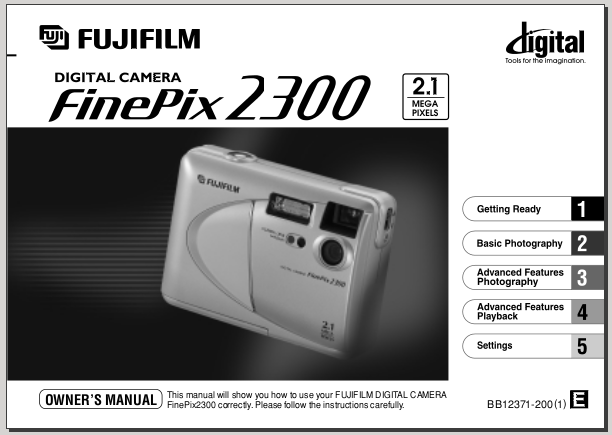 The Fujifilm Finefix 2300 User Manual consist of 78 pages. It's available in english language. It' sdevided into 5 section. The owner's guide provide detail reference information such as Selecting the Language, Attaching the Strap, Using Batteries, Using the AC Power Adapter, using smartmedia. Then about basic photography like taking pictures, playback zoom, erasing single frame, using menu settings, auto flash, formating, protecting, setup mode, Accessories Guide, safety, troubleshooting and more.